This example illustrates the use of cumulative residuals to assess the adequacy of a marginal model for dependent data fit by generalized estimating equations (GEEs). The assessment methods are applied to CD4 count data from an AIDS clinical trial reported by Fischl, Richman, and Hansen (1990) and reanalyzed by Lin, Wei, and Ying (2002). The study randomly assigned 360 HIV patients to the drug AZT and 351 patients to placebo. CD4 counts were measured repeatedly over the course of the study. The data used here are the 4328 measurements taken in the first 40 weeks of the study. where is the time (in weeks) of the kth measurement on the ith patient, is the CD4 count at for the ith patient, and is the indicator of AZT for the ith patient. Normal errors and an independent working correlation are assumed. The following SAS statements fit the preceding model, create the cumulative residual plot in Output 40.9.1, and compute a p-value for the model. Here, the SAS data set variables Time, Time2, TrtTime, and TrtTime2 correspond to , , , and , respectively. The variable Id identifies individual patients. The cumulative residual plot in Output 40.9.1 displays cumulative residuals versus time for the model and 20 simulated realizations. The associated p-value, also shown in Output 40.9.1, is 0.18. These results indicate that a more satisfactory model might be possible. 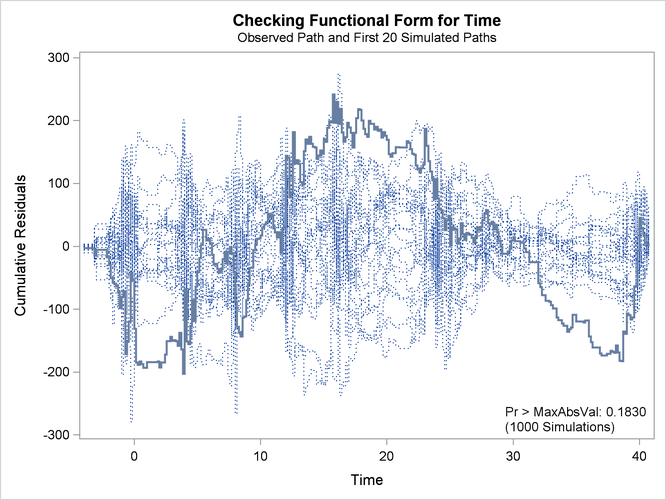 The observed cumulative residual pattern most resembles plot (c) in Output 40.8.6, suggesting cubic time trends. 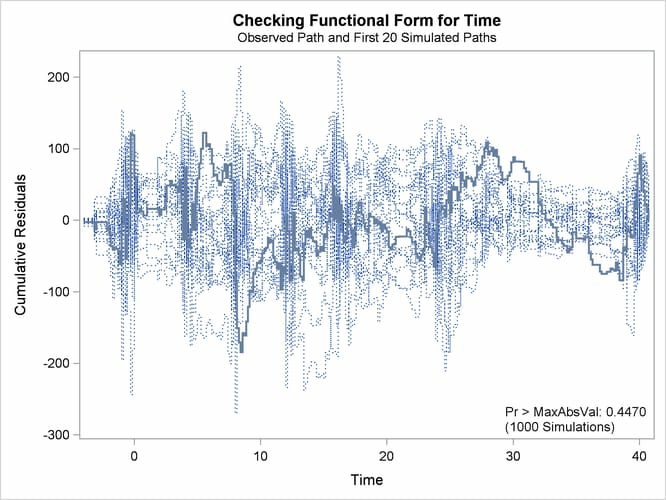 The observed cumulative residual pattern appears more typical of the simulated realizations, and the p-value is 0.45, indicating that the model with cubic time trends is more appropriate.